Our friends Tamara and Sean are crazy foodies and fans of the richness and versatility of chilies. So after receiving the invitation to join them next week for their Thanksgiving feast, I started playing with options on what to bring; with chilies of course. I am fond of sweet potatoes. Called camotes in Mexico, and eaten since Pre-Hispanic times, they tend to be eaten with a sweet spin. The most popular versions are either steamed and drizzled with sweetened condensed milk, honey or syrup as the plantains I recently posted; or cooked into a sweetened paste, molded, caramelized and turned into addictive candies. However, they are also cooked in many other ways. Through my travels and research I have tasted them in soups, puddings, warm salads, purees and even flans. Yet one of my favorite versions is how my mother makes them. She boils, peels and slices them. Then she adds chunks of butter, brown sugar or piloncillo, chile de arbol and into the oven they go. I started from her idea, but opted to make a syrup with what you see in the photo above: butter, brown sugar or shredded piloncillo, orange and lime juice for an extra layer of flavor. 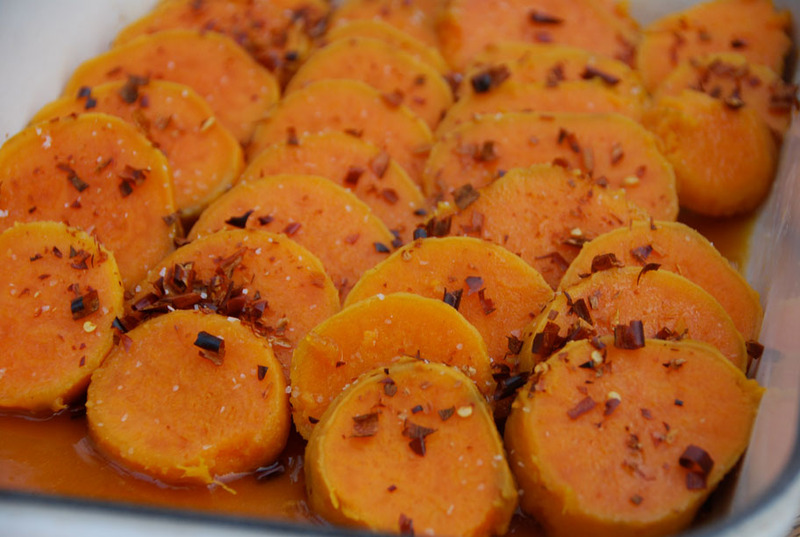 Instead of drinking it all… you can drizzle most of it over the sliced sweet potatoes in a buttered baking dish. For an incredibly earthy, deep and spicy kick, sprinkle some toasted and chopped chile de arbol on top. If you are not familiar with the chile de arbol, this is what they look like. 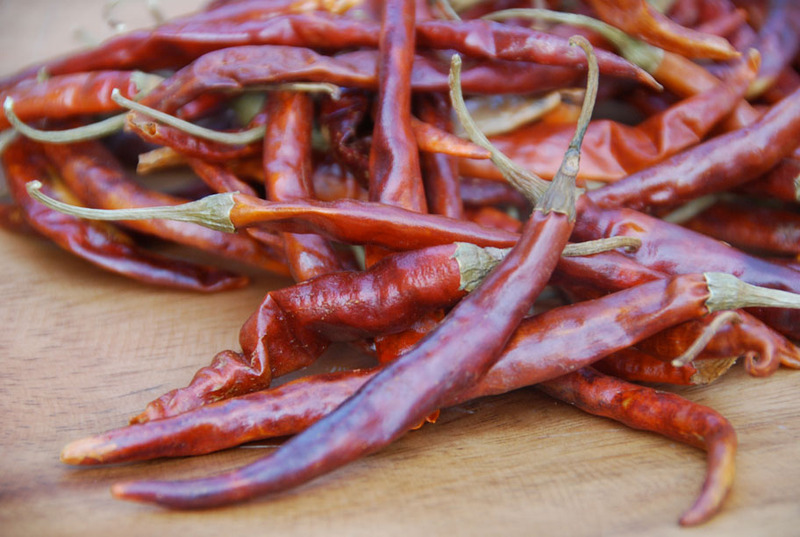 Chile de arbol have become widely available outside of Mexico. 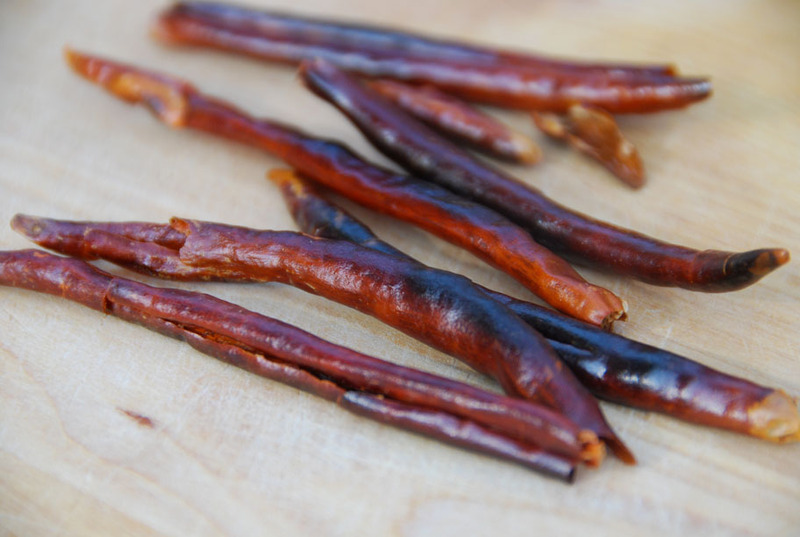 They are thin, elongated, have a beautiful red/orange color, and are spicy with a rich, deep flavor. To use them for this dish just remove the stems, make a slit down their sides and take the seeds off. See how I am opening them up? The seeds just come right off. It takes a minute. In an already hot dry skillet or comal set over medium-low heat (takes 3 to 4 minutes to heat up), toast the chilies for about 20 to 30 seconds on each side. Their inner skin will become opaque, they will let some aroma loose, and their outside skin will gain a toasty dark brown tan. Be careful not to let them burn all over. Then, just give them a friendly chop. And after you do, wash your hands with soap and water… you don’t want to rub your eyes with chile de arbol. If you made more than you need, store them in a closed bag or container. They will keep forever. Once you drizzle the syrup and sprinkle the chopped chile de arbol, add a bit of salt on top. Place in a 425 degree oven for 15 to 20 minutes. And you are set. Ok, that’s before my fork went in! 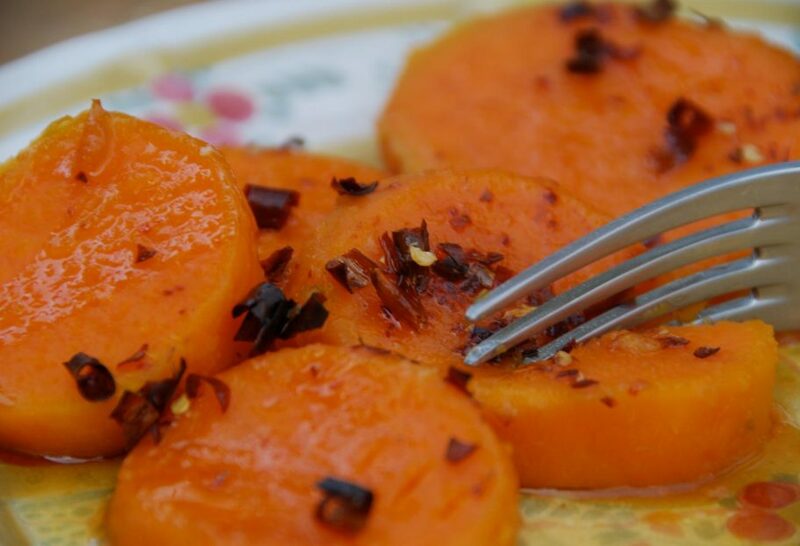 These are sweet potatoes with a delicious citrusy sweet spin and a flavorful spicy kick. Rinse and scrub the sweet potatoes. Place them in a large pot, cover them with water, over medium heat. Once it comes to a boil, reduce heat to low, cover the pot, and let it simmer for about 25 to 35 minutes. You will know they are ready, just like with boiling potatoes, when the tip of a knife can easily go through. Drain and let cool. 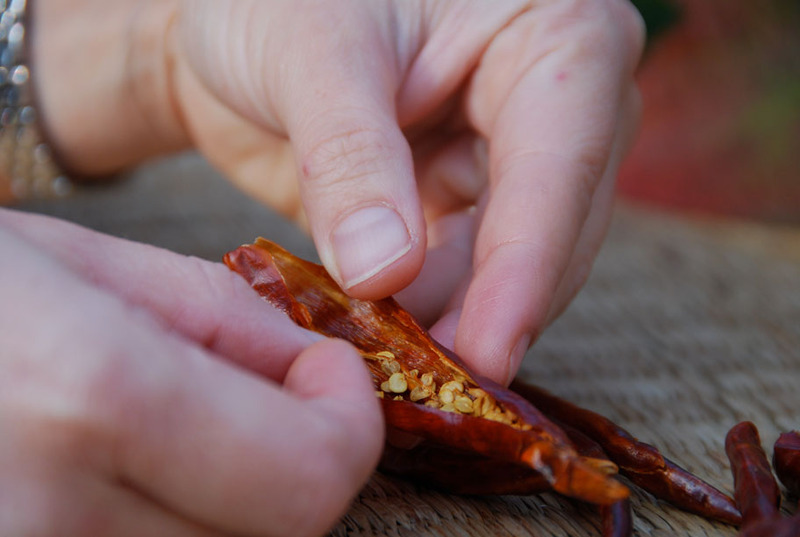 Remove the stems from the chile de arbol, make a slit down their sides and take out the seeds. On a preheated comal or dry skillet over medium-low heat, toast the chiles for about 20 to 30 seconds per side. Their inner skin will have become opaque and the outer skin will achieve a brown tan. Be careful to not let them burn. To make the syrup, place the butter, piloncillo or brown sugar, orange and lime juice in a sauce pan over medium-low heat. 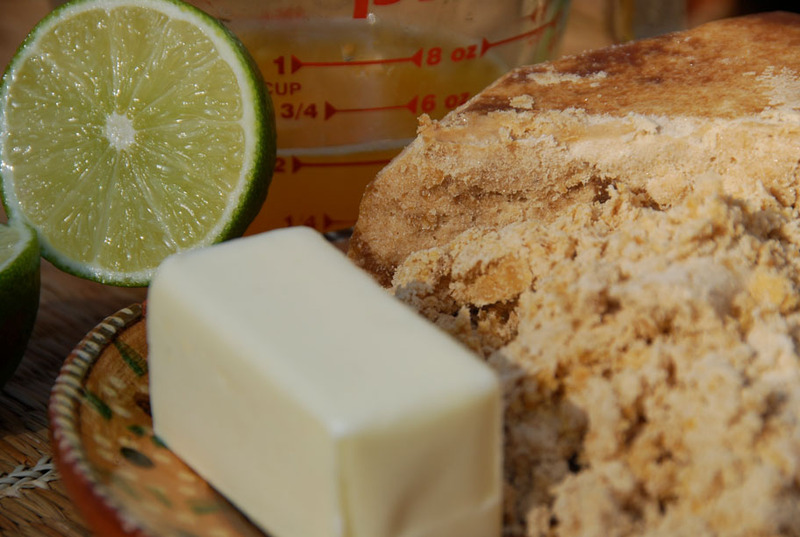 Once the butter dissolves, let it simmer 4 to 5 minutes until it gains a light syrupy consistency. Preheat the oven to 425 degrees and butter a baking dish (I use a 9" x 13"). 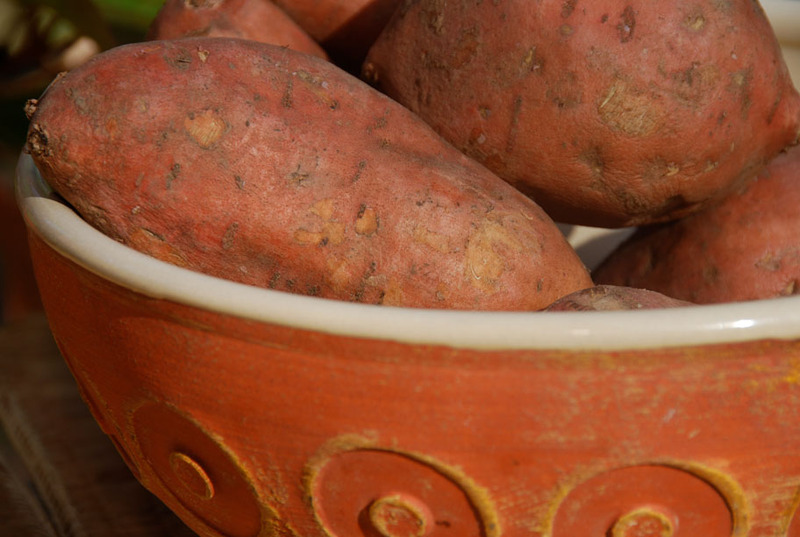 Once the sweet potatoes have cooled, peel and slice them into about 1/2 to 1 inch rounds. Layer them in rows, pour the syrup on top, sprinkle the toasted and chopped chile de arbol and sprinkle some salt on top. Place the dish in the oven and bake anywhere from 15 to 20 minutes. Halfway through, spoon some of the syrup on top of the sweet potatoes. Bake them until the syrup has thickened to your liking and they have achieved a glazed crust. They are specially delicious if eaten while still hot. I love this recipe… now my go to recipe for sweet potaoes! BTW, I’ve made your green posole several times. We all love it !!! I’m so glad you love the pozole! You can absolutely adjust the spice level on the sweet potatoes. You can either use another pepper like guajillo or jalapeño or you can reduce the amount of chile de arbol used. Just use one or two chiles without the seeds. I just prepared this for baking tomorrow. It tastes amazing now, can’t wait for it to come out of the oven. Yummy! Looks so tasty! The sweetness of the orange and potatoes coupled with the heat of the Arbiol is a match made in heaven! Maybe a dollop of creama or quest fresco would be a nice addition!? HOLA Pati! Love yams and this recipe sounds amazing. I never thought of putting Chile in the sweet glaze for yams. This is my trick for using piloncillo, which can be hard to grate. In a deep sauce pan, melt the cone(s) of piloncillo in a small amount of water (1 Tbl. +/- of water per 8 oz. cone) on low heat. Stir continuously until all is melted. Once piloncillo has turned into a syrup, store in a jar with a lid, in the fridge. At this point, it is easy to use, to sweeten your tea, pour over oatmeal, use as you would maple syrup. Hola Susy…hope you like the combo of chile and sweet. This looks wonderful! Just wondering what’s the advantage of sprinkling the toasted chopped chiles instead of mixing them into the syrup before spooning it over the sweet potatoes. Do they have better texture that way? Are the Chile De Arbol spicy hot? I would like to make this but my wife (who is of Mexican and Spanish decent!) has problems with hot chilies making her have a coughing attack. Mildly hot chilies are OK with her. Hm, just use one, and remove the seeds: That should do it! Dear Pati, thanks for all your work! Can you share some ideas on how you actually “grate” the piloncillo? It took some work with a hammer to pulverize it… Any secrets? Thanks! I usually use a box grater when I grate the piloncillo. You can also use a very sharp knife, but i prefer the support that the box grater gives while grating. Do you personally prefer piloncillo or brown sugar? Thanks a lot, IÂ´m new in your site and IÂ´m really liking all the recipes!!! Well depends for what. But in general I can say that I do prefer the taste of piloncillo. There are some baked things that work better with brown sugar though. But as for flavor, YES! Yum! They were a hit on our Thanksgiving table. I added in the zest from the orange and lime. They sounded so good I shared the recipe with friends in Palo Alto and Boston…rave reviews came in this morning. I bet these will be on the table menu again next year. Kim, I am so glad you liked them. And many thanks for passing the recipe around. There seems to be no bigger compliment to a dish, then when it is recommended! Friends! So glad you like these sweet potatoes… I had to lick the plate clean yesterday after I made them… Enjoy! La salsa de piloncillo con el chile de arbol, me pareció una idea genial.